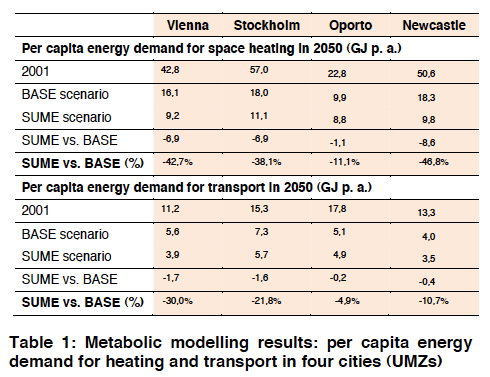 The Project SUME – Sustainable Urban Metabolism for Europe – analyses the relationship between urban form and urban metabolism in a long-term development perspective to 2050. Urban metabolism encompasses all flows of energy and material resources of a city or agglomeration while urban form describes the way cities are built in spatial terms. 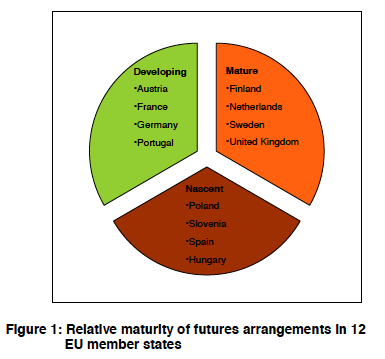 Two different spatial scenarios, the BASE scenario as a continuation of the current development and the SUME scenario as a path of sustainable spatial development, have been elaborated for seven European cities. These scenarios demonstrate a corridor of potential future demands in terms of land use and energy consumption. How Can We Reduce Urban Resource Consumption? In Sustainable Urban Metabolism for Europe (SUME), the concept of urban metabolism is explicitly applied to the organisation of space for the first time, demonstrating the impact of urban form on resource flows by analysing the spatial distri­bution of population and jobs, the transport system and urban building technology. This is per­formed in a long-term scenario approach, projecting the urban development perspectives of seven European urban agglomerations. For four of these agglomerations, a spatially explicit metabolism model has been developed and applied. Urban forms have evolved throughout history and can be changed substantial­ly only over longer periods and/or through dynamic restructuring. In search of opportunities to reduce urban resource consumption, the SUME project estimates the potential for transforming urban building and spatial structures by 2050 by applying alternative spatial development pol­icies for a given demographic and economic development path. Urban agglomerations in Europe show extremely different spatial patterns: some are com­pact and confined; many are fragmented and spread out. 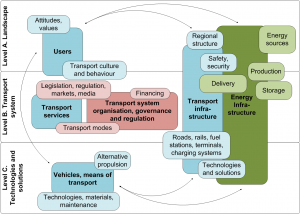 Urban transport systems are of very different qualities: some featuring attractive, well-integrated public transport provision while others strongly rely on individual transport. Technical building standards also vary widely, often depending on the period of construction, and add to the resource impact of a wide range of climatic conditions. All these differences are included in the term ‘urban form’ as it is used here. Approach 1: The given urban form, in all its variations, is taken as a starting point for long-term urban development scenarios by 2050 in order to analyse the future potential of resource-effi­cient transformation. Demographic and economic development dynamics are, of course, the main parameters influencing the potential to change a given urban form. 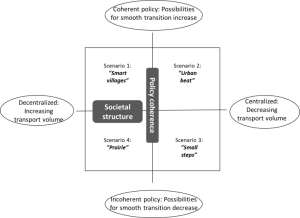 Approach 2: The spatial urban metabolism model allows for systematic simula­tions of the functional relations between socio-economic developments and their consequences on the urban metabolism. Approach 3: Since cities are built step-by-step, with larger or smaller develop­ment projects changing the existing structures, it is important to understand the projects’ individual contributions to the improvement of the overall performance of a city/agglomeration in terms of resource consumption. The Metabolic Im­pact Assessment (MIA) is a novel methodology to evaluate the effect of proposed urban deve­lopment projects on the metabolism of a city. It is a decision-support tool geared toward analysing and understanding the complex metabolic consequences of new urban projects or urban plans, e.g. in terms of energy flows associated with the project, for heating, cooling and transport. 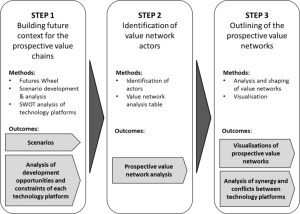 Approach 4: Urban agglomerations’ development processes are very complex. 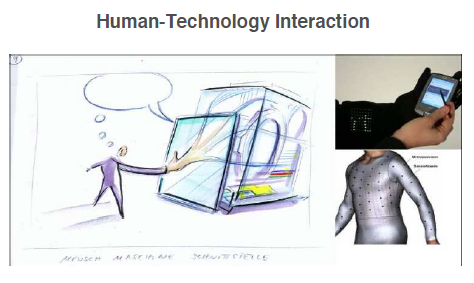 Many factors intersect to generate the spatial pattern that we see in the built environment today. Hence, the processes, actors and their respective rationales were under scrutiny in the SUME project as well. ‘Producers’ of the urban fabric, such as landowners, developers and investors, are im­portant players, but they are not the only actors who matter; ‘consumers’ are also crucial. This group in­cludes individuals and companies who use buildings and spaces in cities, not just the inhabi­tants of homes and offices, but also visitors to the city, whether for work, shopping or recreation. It seems clear that the importance and potential impact of each of the four principles depends on the current urban form of the respective city. The varying range of potential future improve­ments in terms of land use and energy consumption is analysed in the subsequent case studies of cities presented below. 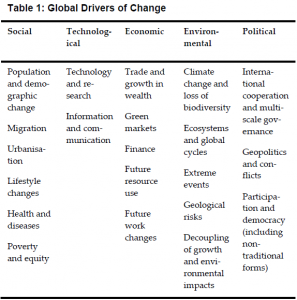 Comparing the urban development scenarios shows that there is a great potential to influence urban form over time if a consistent set of policies is applied. The scenarios also display that the differential between the policy sets adds up and becomes resource-relevant over time. 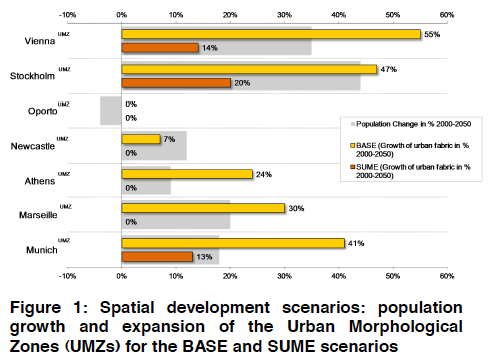 The BASE scenarios show a substantial expansion of the so-called Urban Morphological Zones (UMZs) for the fast growing cities, ranging from growth by 24% in AthensUMZ to 30% in MarseilleUMZ, 41% and 47% in MunichUMZ and StockholmUMZ to 54% in ViennaUMZ. These results are due to population increase, a proportional growth of jobs and a continuing increase in per capita floor space consumption. Based on empirical evi­dence of the past, it has been assumed here that the historical trend of floor space increase will continue in a stable eco­nomic development, but the per capita growth will slow down compared to past decades. 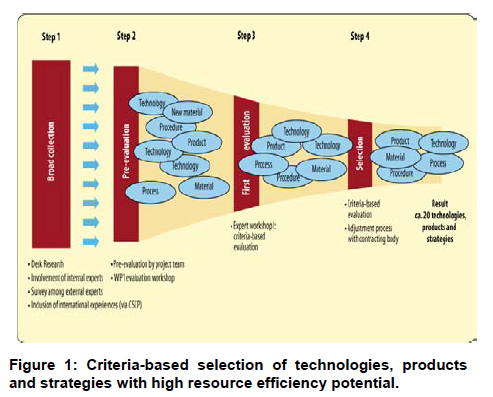 From this ‘baseline’ of expected development, the so-called SUME scenarios demonstrate a develop­ment path that should result in lower resource consumption (land use, energy, materials) and could be reasonably achieved through concerted urban development policy packages. SUME scenarios focus on inner-city development, high-level public transport axes and more compact development on the fringes of the existing UMZ. The continuously built-up area of an agglomeration, as defined by UN-Habitat (200 m maximum distance between buildings, based on the CORINE land-cover data). The potential effects are substantial: the expan­sion of the agglomerations analysed can be avoided altogether in OportoUMZ and NewcastleUMZ, which is also due to their small demographic development, but also in dynamic cities such as AthensUMZ and MarseilleUMZ. The fastest growing agglomerations in the group are MunichUMZ, StockholmUMZ and ViennaUMZ where the expansion by 2050 could be reduced significantly to 13%, 20% and 14% respectively. The results of the two spatial development scenarios for four of the cities were used as input for the spatially disaggregated modelling of energy flows based on the spatial distribution of jobs and residents, localisation of services and central functions, and fast lines of public transport. Table 1 gives an overview of the main results for the agglomeration aggregates for both the building and the transport model. It shows the final state of development in 2050 and compares the per capita energy demand figures for hea­ting and transport in the BASE and SUME scenarios. The main results show that today’s energy demand can be reduced by 60% to 80%, varying between cities and scenarios. 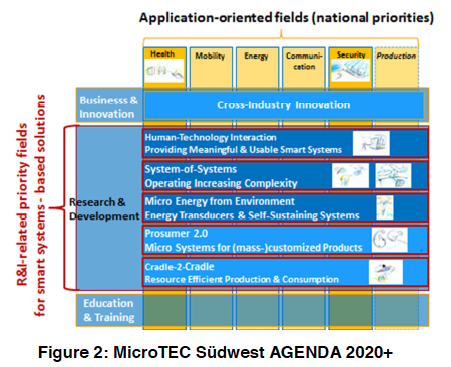 In general, a SUME-scenario-type agglom­eration development will reduce energy consumption between 10% and 40% by the year 2050 compared to the BASE scenario. The results demonstrate that, even in a future agglomeration development using all available technological improvements, there is a large differential between a BASE- and a SUME-type development: A higher replacement or renovation rate of buildings and a better spatial focus of new developments with respect to public transport accessibility will reduce energy con­sumption by 30 to 40%. Only in special situations like in Oporto, where relatively small changes are anticipated for both components, i.e. buildings and transport, will the differ­ential between the BASE and SUME scenarios be less than 10%. 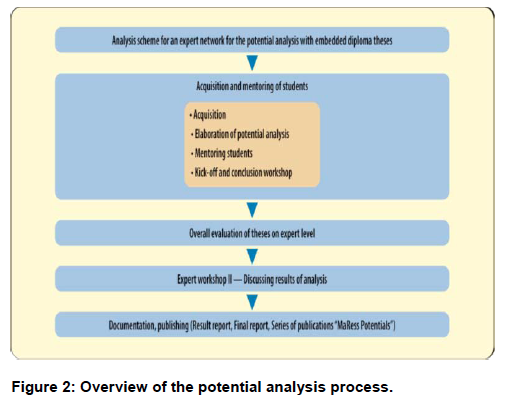 In principle, Metabolic Impact Assessment (MIA) can be applied to different types of planning proposals: policies, programmes, plans and projects. However, within the scope of the SUME project, it was applied to detailed plans of large urban development projects. 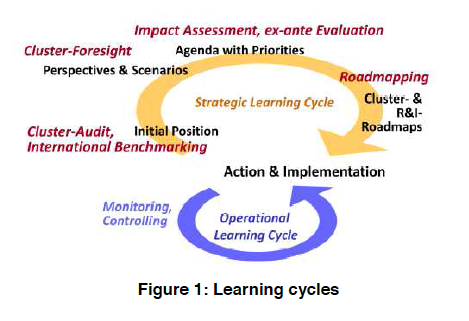 It has been recognised that at more strategic levels, MIA’s application will be more complex and demanding. At a local level, data is more easily identified and the analysis becomes more objective. Within the general objective of SUME to analyse the impacts of urban form on resource use, the application of MIA has focused on specific components of urban metabolism, namely energy, land use, water and materials. Moreover, in each case study some limitations of data have caused further restrictions. The four case studies in the European cities of Vienna, Stockholm, Oporto and Newcastle demonstrate the application of the new method: Metabolic Impact Assessment (MIA). The case studies show the impact of projects, compare them with the performance of alternative projects and of the relevant districts within the agglomeration. Applying MIA can lay the ground­work for improving planning proposals in key aspects of urban metabolism and also contri­bute to the necessary assessment of alternative locations for such projects within the urban fa­bric. MIA shows that it is essential to include the impacts of urban development projects regar­ding infrastructure needs and transport in the agglomeration context because a) unexpected effects in other sections of the complex transport network can be detected and b) underuse of existing infrastructure in certain districts can be determined. Both of these aspects potentially lead to substantial project modifications. Containment at the level of agglomerations: reduce urban expansion to a min­imum, keep travel distances low, provide for good spatial access to public transport routes and attractive service there. Currently most growth happens in the spaces be­tween transport axes in areas out of reach of attractive public transport. Spatially focused densification in low-density urban outskirts: this is a key strategy in growing cities to avoid expansion and improve transport service quality. Locate services and offices at transport nodes and allow for a mix of functions at the neighbourhood level: the busiest nodes of agglomerations’ public transport systems are attractive for office and service space, and most advantageous for the location of jobs with excellent access to public transport. On a neighbourhood scale, it is also important to have a functional mix within each of the urban regions’ neighbourhoods to provide for services and access to daily supplies at short distances. Improve agglomerations’ public transport systems: some urban regions have com­paratively high densities, but do not provide well-developed public transport systems – there exists a great potential for improvements, particularly at the agglomeration level. All urban growth and the life-cycle turnover of built structures should be used as potential to improve the existing urban form, both in terms of spatial structures and object qualities. Urban growth in this sense is not an enemy to sustainable develop­ment but can be a partner in getting there. Larger urban development projects can be located and serviced with infrastructure in such a way that they improve the overall performance of a whole area of a city/agglom­eration (see MIA). At the level of users/developers, all ongoing relocation and renovation activities have the potential to improve urban form if location, building standards and functional distribution (residential, services, jobs) are taken into account constantly and systematically. Renovation and building rehabilitation programmes for urban quarters should reach be­yond improving thermal qualities only, to include raising inner-city attrac­tiveness (green spaces, pedestrian/bicycle mobility, services) and putting metabolism-relevant technology in place (e.g. smart city initiatives, production of renewable energy). In order to follow these strategic recommendations, it will be essential to develop a cross-sectoral approach in urban development, integrating urban planning, housing policies, energy policies, infrastructure provision and transport policies. Such integrated, coherent approaches for the development of new and existing urban quarters, however, are hardly found nowadays. This shortcoming presents the greatest challenge in restructuring European cities along sustainable and resource-efficient line.